Every room, on either the ground floor or the first floor of the five elegant and traditional buildings, has a privileged view on the Perfume River. Pomelo Restaurant is the perfect places for visitors and travelers to discover the rich ancient legacy of Hue’s traditional cuisine. Hue Riverside is a wonderful place to celebrate your wedding in a style you always dreamed about, make your wedding unforgettable. Every room, on either the ground floor or the first floor of the five elegant and traditional buildings, has a privileged view on the Perfume River. The 40 rooms of 24 sqm, are equally divided into double or twin rooms and equipped with Free WiFi. Breakfast is included in the price. 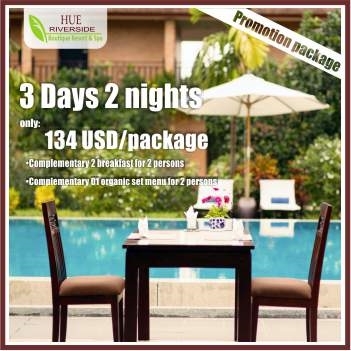 Hue Riverside Boutique Resort & Spa offers visitors Kayak and Bicycle Tours as well as tours to explore Hue Ancient City, the Perfume River and local villages. Hue Riverside Boutique Resort & Spa is located right inside Thuy Bieu Village, Thuy Bieu Ward today is the integration of two ancient villages. One village is Nguyet Bieu and another is Luong Quan. Now, Nguyet Bieu and Luong Quan are preserved intact. There are many activities for guests to enjoy at our resort, including kayaking, cycling, fishing, swimming, volleyball, bird watching and more! Children can enjoy our complimentary in house activities, including our Kids Club, farming with our gardener (kindly book in advance during check in), swim in our swimming pool, feed our rabbits and chickens. Hue Riverside Boutique Resort & Spa is the Best Eco Resort in Hue. A place for Nature lovers to enjoy the perfect escape from a busy life to recharge and get back to Nature. This Eco-Resort is not only environment for human beings but also for other friendly creatures as parts of our life. We hope they do not bother your love of nature. Hue Riverside Boutique Resort & Spa is ideally located on the bank of the Perfume River with a unique view of the Van Thanh Temple just opposite the river. An Eco-Resort displaying traditional styles with modern facilities. Just minutes from the City of Hue, a UNESCO World Heritage Site. For those who would like to experience a rich local Vietnamese village culture, surrounded by stunning organic rice fields, traditional garden houses, River bank with corn fields and spectacular views over treetops to the River and mountain. 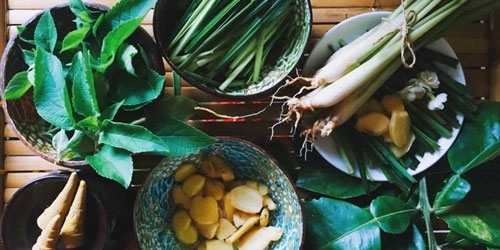 Re-connect with nature on one of our paddy and traditional houses, living like truly Thuy Bieu citizen. Hue Riverside Boutique Resort & Spa is one of the few Eco resorts in Hue. We believe responsible tourism is a better way to see the world. Not only do you get a more authentic experience, but your trip also benefits the environment. As an Eco-Resort we are dedicated to preserve the beauty of our natural environment, using nature power likes Solar power, Windmill to supply energy for daily activities and minimize waste production. With every Thuy Bieu people greeting begin with an infectious smile, you can’t help but fall in love with this dreamlike place and its people. From the very moment of your arrival, you will feel embraced with the warmth and hospitality that is so naturally rooted in each and every aspect of the Vietnamese culture. This is the place to feel loved, nurtured and welcomed by our staffs. Enjoy an adventure and the chance of getting out on the water. Experience kayaking along the Perfume River for free, based from the Hue Riverside Boutique Resort & Spa, kayaks are provided at no cost while you are staying with us. The property has a 4.5-hectare organic garden that services the resort’s Pomelo Restaurant. Pomelo Restaurant is the perfect place for visitors and travelers to discover the rich ancient legacy of Hue’s traditional cuisine. Pomelo Restaurant has been given their name as they are surrounded by over 1000 Pomelo trees. Pomelo trees in Thuy Bieu Village are reputed to be the best tasting in Hue. Our boat will pick up at Resort’s Private Boat Station, taking the magical slow boat ride down the Perfume River for you to visit the beautiful scenery of Hue. Enjoy your lunch with our set menu on our elegant private boat. A perfect place to relax with Jazz, Pop music beside the spacious Pool and homemade fresh cocktails after touring Hue and the surrounding areas having discovered imperial palaces, tombs, pagodas and temples. 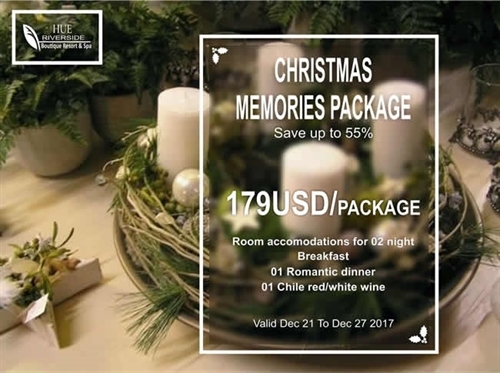 Imagine you are Royalty, King and Queen beside you accompanied by Mandarins sitting with other dignitaries in the Royal styled dining room, and all while dressed as ancient Hue Royals you'll be surprised with authentic, delicious Hue’s Royal Cuisines. During this event as royals you need to follow certain Royal Protocols while Hue Imperial Court Style Music & Dance performers will perform to entertain you. The Hue Riverside Boutique Resort & Spa offers many great spa treatments. Spend some quality time relaxing while combining the professional massage with nature. Having a massage performed on sunburned skin can be unpleasant & uncomfortable. Instead of cancelling your massage session, request a Soothing Sunburn Relief Aloe Body Wrap – a relaxing body treatment to soothe sunburned skin, to prevent peeling, & to restore dehydrated skin. This treatment is wonderful after enjoying a day in the sun! Aloe gel infused with lavender essential oil is applied to body to soothe & cool sunburned skin. This ancient pressure point healing method uses the power and sensitivity of the human hand to press key points on the surface of the skin to stimulate the body's natural self-curative abilities. Reduces tension and enables the body to relax deeply leaving you feeling more alive,healthy and in harmony with your life.